A recently updated report from the Trust for America's Health has Colorado ranked as the state with the 17th highest rate of injury death in the United States. 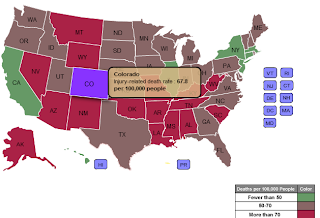 The Colorado fatality rate from injuries (intentional and unintentional) is 67.8 deaths per 100,000 people. The nationwide average is lower at 57.9 injury deaths per 100,000 people. Additionally, Colorado has passed only 5 out of the 10 recommended statewide policies for injury prevention. Learn more about how all of the states rank at the Trust for America's Health's site.